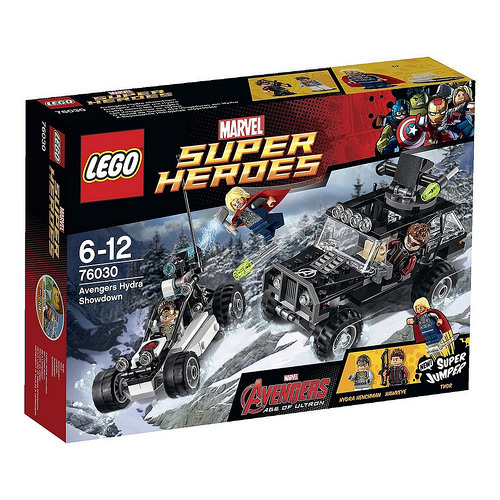 TheBrickFan has uncovered the official images of Avengers: Age of Ultron‘s LEGO sets shown below and as the title says, there are potential spoilers in the descriptions of these sets so read at your own risk. The 'Age of Ultron' LEGOs will be released this April. 'Avengers: Age of Ultron' is the epic follow-up to the biggest Superhero movie of all time. When Tony Stark tries to jumpstart a dormant peacekeeping program, things go awry and Earth’s Mightiest Heroes, including Iron Man, Captain America, Thor, The Incredible Hulk, Black Widow and Hawkeye, are put to the ultimate test as the fate of the planet hangs in the balance. As the villainous Ultron emerges, it is up to The Avengers to stop him from enacting his terrible plans, and soon uneasy alliances and unexpected action pave the way for a unique global adventure. 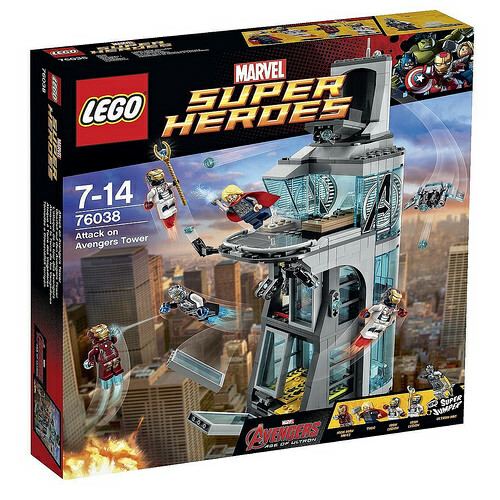 The Heroes are having a party when suddenly Avengers Tower comes under Ultron attack from the inside! Evil Ultron Mark 1 has assembled himself in the lab and is exploding out the windows. Help Iron Man and Thor to defeat Ultron and the 2 Iron Legion accomplices under his control. Make plans in the JARVIS control room and treat injured Super Heroes in the sick bay. An Iron Legion is blasting out the doors and windows of the ground-floor robot bay. The other has stolen the Loki Scepter from the analysis lab so pursue him with Thor and take aim from the roof of the tower with the secret hidden drone and stud shooters. You must retrieve the Scepter and stop Ultron! 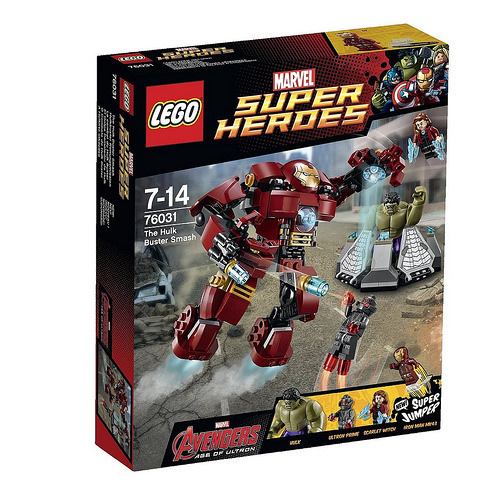 Includes 5 minifigures with a weapon and assorted accessories: Ultron Mark 1, 2 Iron Legions, Iron Man and Thor. Team up with Iron Man MK45 to take on the Ultron army in an ultimate battle! 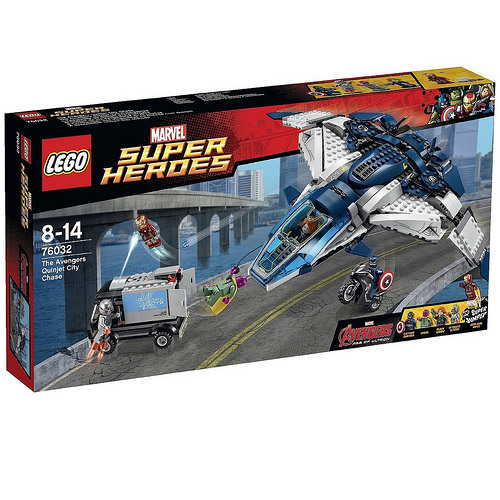 Defend against aerial attacks from the Ultron vehicle piloted by the Sub-Ultron officer. Take cover as Sub-Ultron troopers leap from the back of the vehicle and fire their stud shooters. Then activate Iron Mans Super Jumper to topple the Sub-Ultron officer and bring the vehicle crashing to the ground! 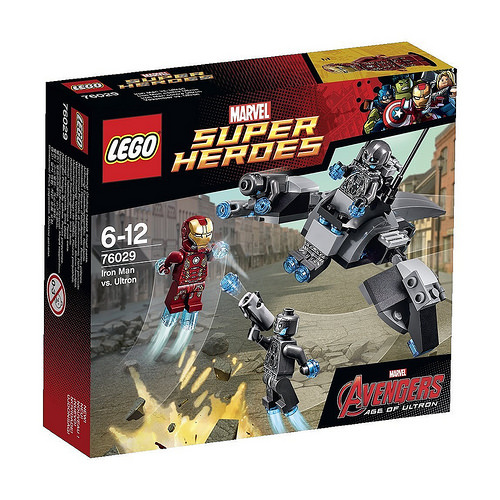 Includes 4 minifigures with assorted weapons and accessories: Sub-Ultron officer, 2 Sub-Ultron troopers and Iron Man MK45. Join Thor and Hawkeye as they chase the Hydra henchman through the Sokovia winter forest! Place Hawkeye in the cockpit of the awesome Avengers 4×4 vehicle and accelerate away. When you have the Hydra offroader in your sights, fire the flick missiles from the rotating turret and swerve away from the offroaders powerful stud shooter. Then launch Thor on his Super Jumper and disable the stud shooter with one perfectly aimed jump! 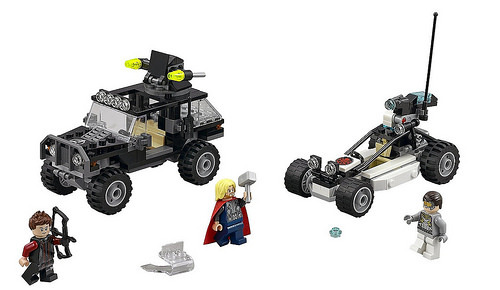 Includes 3 minifigures with assorted weapons and accessories: Thor, Hawkeye and Hydra henchman. Hulk has been trapped by the powers of Scarlet Witch and she is ready to fire an electrical bolt if he tries to escape! Place Iron Man in the cockpit of the humungous Hulk Buster suit and rush to the rescue. On the way you must fend off aerial attacks from the flying Ultron. Adjust the Hulk Busters arms and legs to create fearsome battle poses and grab the villain with the powerful hands. With Ultron safely in the mechs grip, attach Iron Man to his Super Jumper. Then take out Scarlet Witch with an accurate jump and free the imprisoned Hulk! 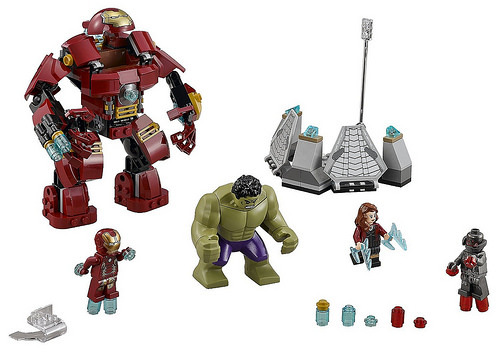 Includes 3 minifigures with assorted weapons and accessories: Iron Man, Ultron and Scarlet Witch, plus a Hulk figure. Launch a high-speed pursuit of Ultron with the Avengers in the iconic Quinjet. Place Black Widow at the controls in the cockpit and soar into the sky. Fire the stud shooters and release Captain America on his super-cool bike to take the pursuit to the streets. Iron Man MK43 is flying alongside the Quinjet using his thrusters, ready to take on Ultron. When the time is right, make the perfect jump onto the truck to explode the sides and reveal the precious cargo. 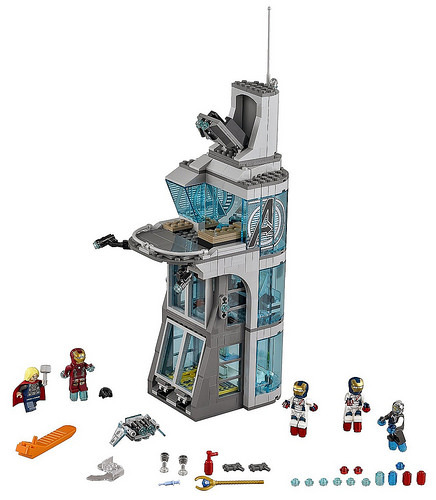 Includes 5 minifigures with assorted accessories: Vision, Captain America, Black Widow, Iron Man and Ultron.